Winston Keech, an engineer and inventor, describes his first encounter with a crop circle being created at the now-famous "East Field" in Wiltshire, UK. 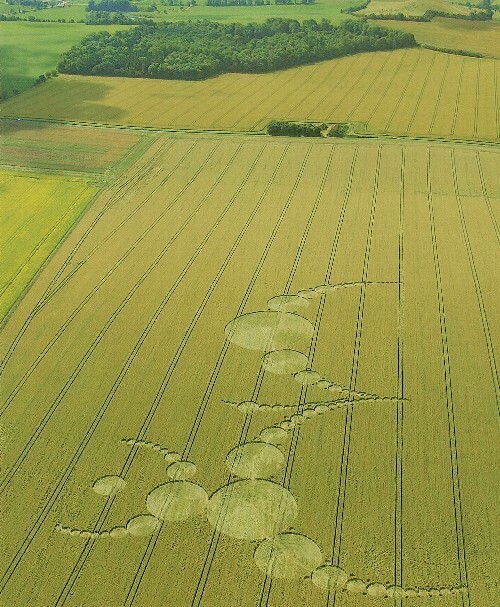 Mr. Keech says he witnessed an "illuminated object," about the size of a dinner plate, creating a single crop circle in the same location as the now-famous East Field Formation that appeared on 07-07-07 - September 07, 2007(see photo below). Keech explains that he was in the field late at night hoping to witness a UFO creating a crop circle, but instead he says he was acutely aware of an "almost taunting, slightly child-like consciousness" pervading the field. Keech said that he felt like he was being observed and he described the feeling as "intense". He said he was actually able to see a small illuminated disk in the corner of his eye, leisurely floating above the corn, but he could not see it if he tried to look straight at it. He states that he observed with his peripheral vision the small disk of light quickly expand to about twenty feet in diameter, at which point the corn began to shake, and then all of it fell at once - the crop circle, he says, was created in a mere 3 seconds. Learn more about the famous East Field formation that took place on 07-07-07 in Commas and Semi Colons. Circumstantial evidence has shown that crop circles may very well be made by ‘balls of light' indeed! This article explains the essential elements of these studies in simple terms. The stems of corn-type plants are characterized by little ‘knuckles', at several positions along the stems (see Figure 1). These nodes act as a kind of ligament. They allow the plants to bend towards the light, even after they have grown to their full length. In the early 1990s, the American biophysicist William Levengood discovered that plants inside crop circles often had much longer nodes than those in the undisturbed, surrounding crop. This effect is illustrated in Figure 2. Although there are known biological effects that can create node lengthening, these could be easily ruled out. It was clear that something else had happened. The effect could be simulated by placing normal, healthy stems inside a microwave oven. The heat induced by the microwaves made the liquids inside the nodes expand, just like the mercury inside a thermometer. This caused the nodes to increase in length, while the amount of lengthening increased proportionally to the amount of microwave energy that was generated. This finding led to the conclusion that the node lengthening effect may be caused by the involvement of heat, possibly caused by microwave radiation. In fact, traces of heat have been found innumerable times in crop circles all over the world, such as dehydrated plants, burn marks, and molten snow. The number of ‘balls of light' that have been seen by eyewitnesses has increased considerably over the last couple of years. Sized somewhere between an egg and a football, these bright, fluorescent, flying light objects seem to be somehow related to the crop circle phenomenon. They often appear in the fields during the night a crop circle forms, and have been seen (and filmed!) many times in and around crop circles. Several persons have even claimed that they witnessed how these balls of light actually created a crop circle. In the year 1999, William Levengood and Nancy Talbott published a scientific paper  that contained a study to the node lengthening effect in three different crop circles, two in England and one in the USA. The authors presented a ‘quantitative analysis’; in other words, the article tried to explain the AMOUNT of node lengthening throughout the crop circle, by means of physical models. The authors concluded that the heat (that had made the nodes swell) was electromagnetic in origin. One year later, I contributed a paper reacting to the one by Levengood and Talbott. This article appeared early 2001 . The paper reinterpreted the data published by Levengood and Talbott and showed that the node lengthening as measured in all three crop circles could be perfectly explained by assuming that a ‘ball of light’ had caused the node swelling effect. An identical analysis performed on a famous man-made formation (Dreischor, Holland, 1997) did not show these characteristics at all. The exact light distribution on the floor depends on the HEIGHT of the light bulb. When the light bulb is hanging very low, almost touching the floor, the floor underneath the light bulb will be very bright, but the intensity will rapidly become less as you move away from it (Figure 3). When the light is hanging high on the ceiling, however, the light intensity underneath the light will be much less and be more evenly distributed over the floor (see Figure 3). Because this mechanism is so well known, one can actually derive the height of the light bulb after measuring the light distribution on the floor. This is what I suggested. As explained above, the swollen nodes inside the crop circles may be thought of as many little thermometers, expanding their length with increasing heat. If one assumes that the heat was induced by a small spherical shape emitting electromagnetic radiation, the theoretical heat distribution on the floor can be accurately determined (similarly to the case of the light bulb, as discussed above). I demonstrated that the measured node lengths in all of the three crop circles studies by Levengood and Talbott perfectly matched the temperature distribution that would be caused by a small ball of light, hanging in the air above the centre of the circles, emitting intense heat. An identical analysis was repeated on a formation in Holland . An eye witness claimed that this crop circle was created in a matter of seconds, while a "ball of light" was floating in the air, right above the centre of the circle . Figure 4 shows the results. The yellow bars indicate the average node length measured at seven different locations across the crop circle, from one edge (position b1), through the centre (a4), to the opposite edge (b7). Note the perfect symmetry, which is remarkable! Similar graphs were obtained from two different cross sections through the circle, revealing a perfect circular symmetry: long nodes towards the centre of the circle, shorter nodes towards the edges. The thick, continuous, bluish line represents the theoretical value of the node length across the circle, if it were caused by a ball of light at a height of 4 meters and 10 centimeters. (This height corresponded to the estimate of the eyewitness). Just like the three crop circles analyzed by Levengood and Talbott, the theoretical values for the node length (blue line) correspond perfectly to the measurements (yellow bars). the crop circle was indeed created with the involvement of a "ball of light". Finally, it should be mentioned that all these findings and conclusions have been published in ‘peer-reviewed’ scientific journals. In order to guarantee a high level of reliability, such journals employ so-called ‘referees’ (objective, anonymous experts), who accurately check each contributed paper for errors and inconsistencies before it is published. Consequently, conclusions published in peer-reviewed scientific journals can not be simply dismissed as wild fantasy or pseudo-science. Therefore, it is fair to say that recent scientific findings have established considerable progress in understanding the crop circle phenomenon, although many questions still remain unanswered. See, for example, N P Talbott, http://www.crystalinks.com/crop1999.2.html or http://www.labyrinthina.com/crop.htm. One of the more interesting videos concerning crop circles may be seen in this documentary from the U.K.. The producers interviewed physicist Dr. Eltjo Haselhoff of the Netherlands. Dr. Haselhoff offers scientific proof that at least some crop circles are indeed formed by balls of light. His research and evidence was even accepted after peer review for the internationally recognized scientific journal, Physiologia Plantarum.